President Kate Dilks welcomed 54 members and 4 guests to the November meeting. Hostesses were thanked, and Patricia Robinson was thanked for the flower arrangement on the President’s table. Our team which entered the East Kent Federation’s Top Team Quiz came joint 9th out of 26 teams but only 7 points behind the winners. We only had 5 in the team so hopefully next year we will be able to enter a full team of 6. Kate thanked everyone who had knitted or crocheted poppies which had been distributed . Please click here to read an article on where your poppies have been displayed. Remembrance Sunday, as usual, our President laid a wreath on behalf of members during the service at the war memorial on the Green. After coffee we welcomed Eileen Jennings who told us of her adventures as a volunteer. Eileen first volunteered with the Jumbulance taking disabled people to Lourdes then with the Jubilee Sailing Trust. For many years she took working holidays with the National Trust choosing a different property each year. Lundy island, Waddesdon House, Orford Ness and Montacute House to name but a few. She also took part in the first Moon Walk in London. 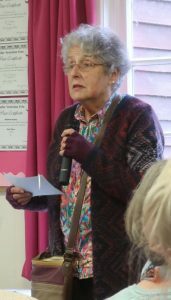 Today she is still volunteering, helping children with reading at Lyminge primary school and the Archaeological dig in Lyminge. Eileen’s talk was amusing and informative. Margaret Wilson gave the vote of thanks. The competition was won by Hortense Oates for her lovely spray of roses.